HDV and DVCAM are high-definition video recording formats. These formats use the smaller MiniDV tapes and medium sized DVCAM tapes. HDV is able to produce a high definition image by compressing the amount of data imprinted onto the tape. Videographers appreciated this format because of its wide acceptance (being supported by JVC, Sony, Canon, and Sharp), low cost, small size, and high image quality. DVCAM is a professional version of DV created by Sony. The tape is transported 50% faster. This provides better quality, but less compatibility with consumer-based products. You can expect to record up to 45 minutes of DVCAM footage on a 60 minute MiniDV tape. Video recording directly to file is convenient, reliable, and easier than ever. Video cassettes are becoming obsolete. Players are hard to find, and soon will be gone forever. Don’t wait any longer to convert your HDV tapes to digital files! We convert HDV PAL / DVCAM PAL! Los Angeles Video Transfer Service can convert your HDV tapes to disc or digital file*. DVCAM tapes can be converted to DVD and SD (standard definition) file, and HDV tapes can be converted to DVD, Blu-ray, and HD (high definition) file. 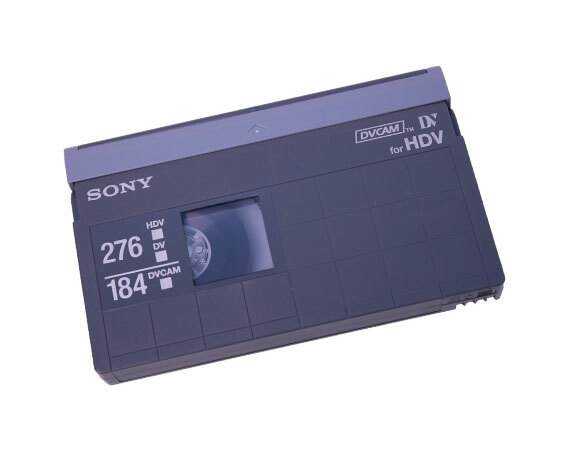 *Since HDV is a digital format, we recommend transferring these tapes to digital files which are stored on a hard drive.